"This is for the person looking for a spicy ranch dip. It's great served with fries, poppers, and even wings." Stir together the ranch-style salad dressing, the two hot pepper sauces, cayenne pepper, and chili powder. Chill for at least one hour. since posting yhis recipe, i too have switched to the homemade ranch. Great recipe! I don't personally care for bottled ranch as it is too tangy, so I used the Hidden Valley Buttermilk Packets to make my own ranch. This was perfect for some beer battered pickles I made! So yummy! I can't eat home made fries without it! 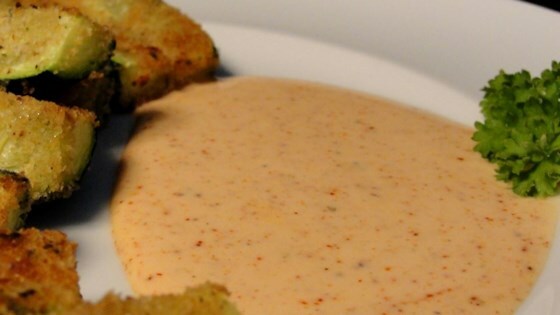 Made this to go with our onion blossom from our air fryer and it was great-it’s a keeper! My new favorite dressing...so good! I didn't have Tabasco so I substituted Habanero sauce, which made it Spicy Spicy Spicy Ranch. Mmmmmmm!